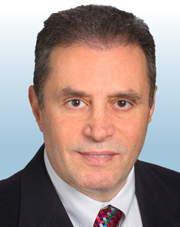 Kantarjian has developed and demonstrated the effectiveness of a number of major treatments, including chemotherapy combinations and the single agent clofarabine for acute lymphocytic leukemia (ALL); the hypomethylating agent decitabine, approved by the FDA for myelodysplastic syndrome (MDS) in 2006; liposomal vincristine, approved by the FDA for ALL in 2012; and ruxolitinib, approved for myelofibrosis in 2011. His research has helped to develop and champion multiple targeted therapies for chronic myeloid leukemia (CML), including imatinib, dasatinib, nilotinib, ponatinib, bosutinib, and omacetaxine, all of which received FDA approvals for CML from 2001-2012. He is currently developing monoclonal antibodies in adult ALL. Kantarjian is on the editorial board of Clinical Cancer Research and serves on the boards of several other scientific journals. He is a member of several other professional organizations, including the American Association for the Advancement of Science, the American Society of Hematology, and the American Society of Clinical Oncology. He also serves on the board of directors of the 35,000-member American Society of Clinical Oncology. He established the world-renowned Department of Leukemia at The University of Texas MD Anderson Cancer Center and mentored many internationally recognized experts in the field of clinical leukemia research. Research and clinical trials conducted at MD Anderson have been instrumental in discovering new, more effective combination treatments, and in FDA approval of new drugs for ALL, CML, MDS, acute myeloid leukemia, and myelofibrosis. Kantarjian received a lifetime achievement award for his dedication to research and clinical practice from Castle Connolly in 2014.